This is divided into 2 sections.If you can answer yes to all the questions in the first section you have a member of the Hymenoptera (bees, wasps, ants, saw flies), if you can answer no to even a single question then you do not have an insect that is part of the Hymenoptera family. The questions refer to the wings and legs. Does it have two pairs of wings (see below) with the front pair larger than the rear pair? It is not always easy to see the two pairs of a bees wings as the hind wings are zipped to the front pair (see the photograph below), so look carefully and if necessary put the insect in a jar in the refrigerator for a few minutes to slow it down. Are both pairs of wings membranous (see below) for their whole length? This means that it doesn't have a hard pair of front wings like beetles, grasshoppers or some bugs do. Are the wings are transparent or almost so, and not covered in scales as butterfly wings or hairy as caddis fly wings are? 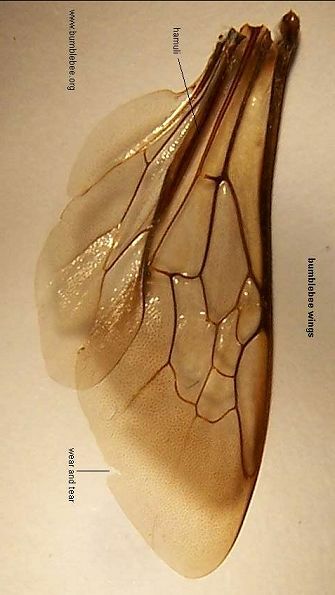 Are the wings without the dense network of veins found in dragonfly and mayfly wings? Does the tarsus have 4 or more segments? The tarsus consists of the segments found at the end of the leg just before the claws. 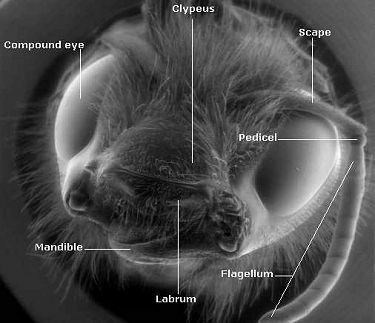 Have a look at the drawing below of the hind leg of a bumblebee queen or worker. If you can answer yes to all the above your insect is either part of the Hymenoptera family or a scorpion fly. Scorpion fly males have a tail like a scorpion, and both males and females have a very long beak-like head. Next you must do the same to find out if you have a bumblebee. Does the insect have a visible waist? Do remember that bumblebees are hairy so you may not be able to see this at first, but if you can persuade the bee to bend or if you can get a look at its underside you will clearly see a waist. If it doesn't it is probably a sawfly. Are the antennae (feelers) elbowed? The first segment of the antennae (scape) should be very much longer than all the following segments, and the antennae are often bent at the join between the long segment and the first short segment. Have a look at the bumblebee head below. Are there 13 or fewer segments (including the long one) in the antennae? Is the insect more or less covered in hair of a variety of colours but with the colour of the body underneath the hair always black? Is the first tarsal segment of the leg, i.e. the one just after the pollen basket (tibia) of the hindmost leg broad and with hairs (see the drawing of the bumblebee leg above)? Does the hindmost leg have either a flat, shiny pollen basket, this may be obscured by pollen (females), or a dull, hairy but still flat area instead of a pollen basket, or not carrying pollen (males, cuckoo bumblebees)? Is there a space between the bottom of the eye and the mandible (jaw)? i.e. the eye doesn't reach right down to the mandible (see the photograph above)? Does it visit flowers to drink nectar with a tongue that is at least 5mm long? When not in use is the tongue usually folded under its body? Does is make its nest in a ready made space, e.g. a mouse nest, a ball of grass? Bumblebees do not dig their own nest and do not tunnel into wood. They may modify an existing space though. If you have answered yes to all of these, then you have a bumblebee. Now if you want to identify which species it is you can try the 6 common species first (don't forget there is an e-book on the downloads page), then if that doesn't identify it, try the less common species and the cuckoo species, the North American bumblebees and cuckoos.